Crystallise takes an innovative approach to managing and modelling biomedical information. We develop products and tools that help us make our consultancy services more efficient and effective, giving clients the support they need in a timely and affordable way. Our expertise in medicine, modelling, coding, microbiology and psychology, combined with our experience of working across the pharmaceutical, finance and healthcare sectors, gives us a unique approach to finding ingenious solutions to problems and delivering high-quality new products and services. Our database of pre-indexed studies on the humanistic and economic burden of disease saves days of screening time. We can search more broadly for studies without incurring greater costs and delays. The interactive spreadsheet shows all studies identified by abstract screening, indexed by topic. Targeted reviews become methodologically transparent. Systematic reviews can be scoped quickly and cheaply. We can replicate populations typical of the UK population or clinical study participants. 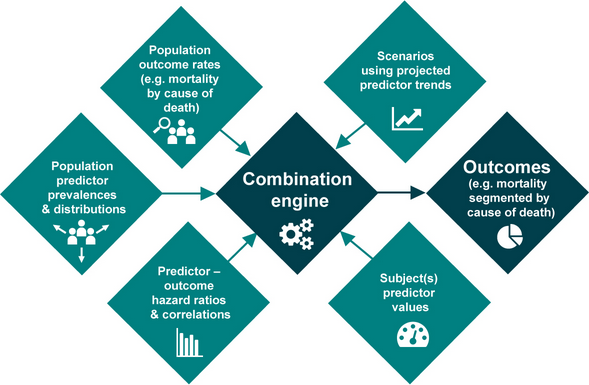 The sample can be used to model the impact of interventions on mortality and other outcomes. We can identify mortality trends over time for specific diseases and predict individual life expectancy. We track weekly mortality statistics for England to help finance, pharmaceutical and healthcare clients predict trends and financial liabilities. Our flexible approach supports the modelling of new and established pathogens and the impact of interventions and behavioural modifications. We collaborate with experts to conduct network meta-analyses and economic models for HTA submissions.